Margaret’s home suffered massive damage due to Hurricane Lane. Her house and property not only flooded, every square inch of the interior of her home was covered with mud, sludge, silt and debris. As this was not bad enough, Margaret’s house suffered severe damage to the foundation. The fast flowing water was so vehement, it tore down both her concrete and rock wall in the front and back of the house. In addition, the fast flowing waters even caused her late husbands Ford truck to be literally picked up out of the covered carport and literally floated down the driveway 40-50 feet. If it were not for another truck blocking the long driveway, the Ford truck could literally have caused much more devastation if it had slammed into the adjacent house. Fast flowing waters from the nearby overflowing Wailuku river inundated Margarets home. Although Emergency responders showed up in record time, dangerous fast flowing water conditions and 4 feet high waters prevented the Fire and Rescue team to get her out right away. Her neighbors had to crawl through the bushes to get her to safety until Fire and Rescue could pull all of them out safely. 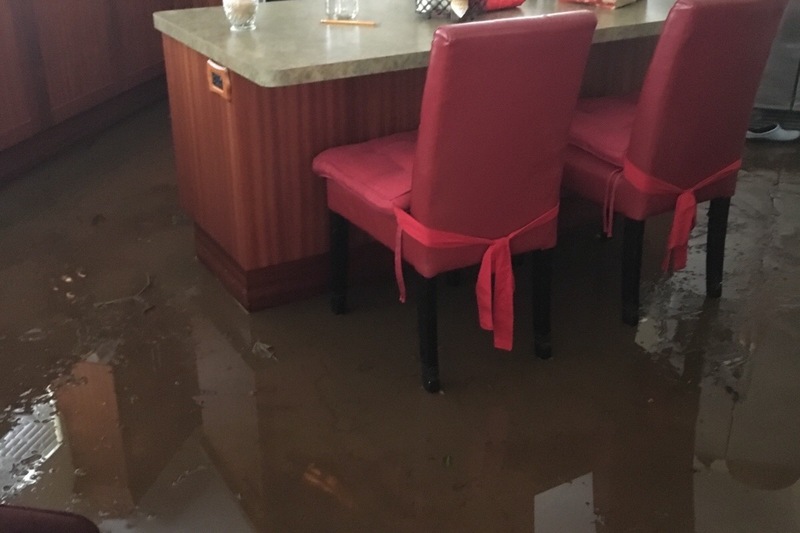 4 hours after flood waters inundated Margaret’s home, at 2:30 a.m, Margaret and her neighbors were finally pulled to safety by Fire and Rescue. Much Mahalo to Hawai’i County Police & Hawai’i County Fire and Rescue for putting themselves in harms way to get Margaret and her neighbors out safely. At the age of 69, Margaret has truly been through a lot. Luckily, Margaret is safe. Luckily Margaret survived this tragic ordeal. The fast moving waters could have cause much more devastation. Luckily Fire and Rescue was able to pull her to safety after 4 gruelsome hours of waiting. Margaret was incredibly lucky. Her home was not so lucky. Insurance claims have been filed, however based on preliminary findings, insurance does not look like it will cover the extensive damages. Margaret will be required to pull out and replace all of her flooring, cut the drywall about 1-2 feet throughout the entire house and replace it. She will need to pull out her kitchen cabinets to avoid black mold from setting in due to all the water damage. First and foremost though, she will need to get a contractor in to replace her foundation before her house suffers more damage (due to a non existent foundation under parts of her home). The list goes on and on in regards to everything Margaret needs to do to rebuild, restore and repair. I am setting up this Go Fund me page on behalf of Margaret. Margaret is a friend and previous Co worker. Although Margaret is now retired, her friends and I are always watching out for her. 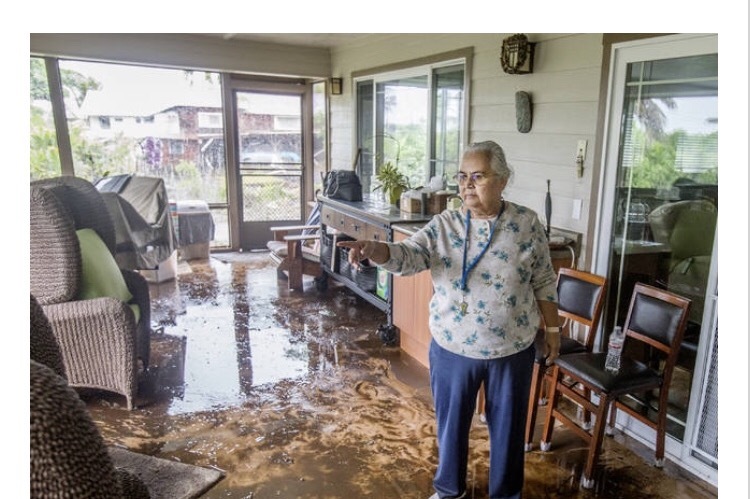 She is truly a remarkable woman and it will takes months to repair her home and to replace her belongings damaged during the torrential rains due to Hurricane Lane. Although Hurricane Lane did not cause as much damage and destruction as predicted, the 35 or more inches of rain the Big Island suffered as a result of Hurricane Lane wreaked sooooo much havoc. Margaret is always quick to donate to charitable organizations, and this time she needs our help. Please help. Any little bit helps. Money will be spent on repairing, rebuilding and restoring her home . The below picture shows the mud, sludge, silt in Margarets kitchen. Note, her flooring is not this color. For more then 2 days now the mud, sludge, silt and debris has been sitting there, causing her floor to buckle and continuing to damage her home more. Quick action needs to be done to prevent more damage. Thank you again for your donation and consideration to help Margaret! OMG I just got notified I have to move the furniture from where it’s been in storage. Well the drywall is finally being replaced. Next will be to paint the walls. FEMA reports that the the flooding we experience is categorized as a 200 - 500 year flood. The local newspaper gives an account of how much rainfall we experience! Now I have learned that I need a plumber to restore all the plumbing fixtures. Plumbers are not cheap. They cost as much as a doctors appointment with no copay!